Finding the right bow for your recreational and hunting archery activities is more important than you realize. Some of you might believe that the most critical part of your archery is the arrows, but that’s wrong. There are multiple types of arrows available on the market, and the kind that you buy depends significantly on where you would use them for. 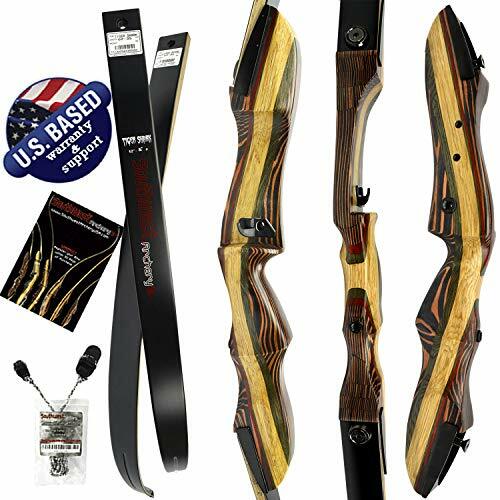 In this product review, we will look at the Tigershark Takedown Recurve Bow and Arrow Set. If you are searching for a heavy-duty bow and arrow set, then keep on reading as this could be exactly what you need. The Tigershark Takedown Recurve Bow and Arrow Set is manufactured by Southwest Archery and is quickly growing to be a well-known bow. Having been involved in creating and designing archery equipment for over two decades now, Southwest Archery has the engineers and developers that are responsible for the Samick Sage, and the Tigershark is known as the third generation upgrade. Southwest Archery created the Tigershark with the primary focus of providing people with a dependable bow that can be used for all types of archery. The optional stringer that comes with this bow has poor quality. As one of the most popular recurve bows on the market, you can rest easy knowing that your bow has top-of-the-line specifications that make it stand the test of time. The engineers of the company worked hard to combine four types of wood into the beautifully designed bow that has both a left and right-hand orientation. The draw weights range from 25 to 60 pounds, making it versatile and compatible for almost every type of archery recreation. Precision-pin locking technology was introduced with the Tigershark Takedown to ensure more precision than before. The lightweight design makes it easy to disassemble and carry around with you, while the improved structure of the bow makes it comparable to high-end bows, but at an affordable price. The only downfall that we noticed when testing the Tigershark is that the string seemed relatively cheap in comparison to the way the rest of the bow was designed. Thus, we would recommend purchasing different strings if you plan on using the bow for more heavy duty archery activities. When you purchase the Tigershark Takedown Recurve Bow and Arrow Set, you get everything that you need to assemble the bow. You receive a right-handed or a left-handed handcrafted riser, upper and lower limbs, a 14-strand Dacron string, either an adhesive arrow rest or an arrow shelf rest, a detailed owner’s manual inclusive of step-by-step instructions and photos, and the option to include a stringer tool if it’s not something that you already have. Also, you will receive a one-year manufacturer’s warranty when you register the set online within 30 days of purchase. Before shooting the recurve bow for the first time, it’s imperative that you have a basic understanding of what you’re doing so you don’t risk injury. You can follow along with this brief and essential guide to help you understand how to shoot your recurve bow, and we’ve also included a video to provide you with more information. The very first thing you should do is make sure that your feet are wide apart. Also, you should stand with your hips, torso, and body turned perpendicular to the target. When you are preparing to take your shot, you should lift your arrow to shoulder height and ensure that your arm is bent and locked at the elbow. Your shoulders should also be kept down as you prepare to shoot, and your elbow shouldn’t be rotated in any way, and your head should be turned towards the target. Once you are ready to draw the bow, pull the string back until it reaches the corner of your mouth. Your back muscles should be doing the majority of the work as they are stronger than your arms. Use your dominant eye to aim at your target and keep your other eye closed, but relaxed. The most important part of releasing your arrow is to remain comfortable, even after it’s been launched. It’s a necessary part of your fundamental training. We found that the only similar alternatives you are going to come across are the Samick Sage or the Spyder Takedown Recurve Bow, also by Southwest Archery. The bow is similar in cost, has exceptional customer feedback, and includes the majority of features that the Tigershark does. It has a draw weight of 20 to 60 pounds and is recommended for beginner and intermediate archers. Versatility takes on a new form with the Tigershark Takedown. 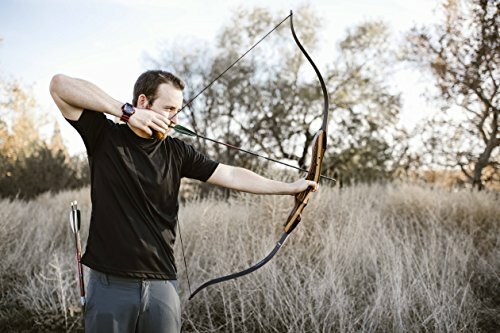 Its wide ranges of draw weights that climb in increments of five pounds make it the perfect choice for archers interested in hunting, archery sports, recreational fun, live action role play, and anything else you’d need a recurve bow for. 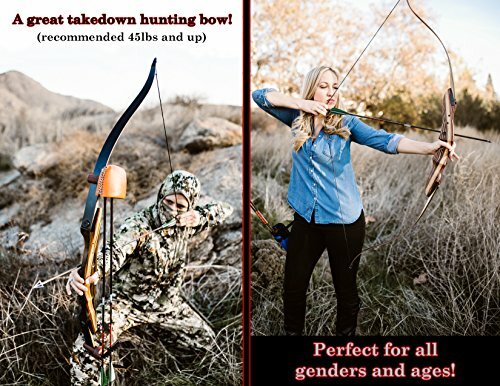 The company doesn’t suggest that anyone under the age of 14 years old use the bow without adult supervision, but regardless of skill level, the bow is more than suitable to meet your needs. Those of you who are just starting out and have a smaller frame can invest in bows with lighter draw weight, while more experienced archers and hunters should invest in one with a heavier draw weight, as the propelled arrows pack more of a punch. Our overall conclusion of the Tigershark Takedown Recurve Bow and Arrow Set is excellent. While there were some issues with the arrows, the bow itself is one of the best that we’ve seen for the price range. The reputation of the company, along with the customer feedback is enough to tell you that purchasing the Tigershark is a smart investment. The state-of-the-art precision-pin technology, impressively wide range of available draw weights, manufacturer’s warranty, and very clear documentation should have you lining up to purchase it. The Samick Sage was one of the best bows on the market, and the upgraded Tigershark has even more to offer. If you're not interested in any of the bows we reviewed here, why don't check out our detailed list of the 5 most popular recurve bow brands!